It’s 5am in Taos, New Mexico and you’ve either been partying all starry night long or you’re getting up for work…(or both). 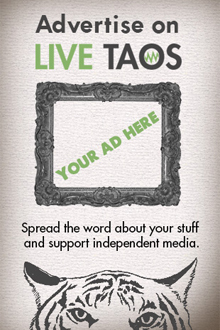 Where in Taos can you get something that resembles warm food, and perhaps a beverage besides warm beer, this late (or early)? Allsup’s is that place, my “I’ve never had Thai food” friends!!! 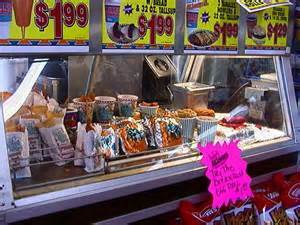 As soon as you walk in, the smell of unidentified fried items permeates the air, covering up that usual bathroom or old funky never-sold-item smell (which is very heart-clogging, I mean -warming, in a hometown-nostalgia kinda way). Waiting to greet you with an official lovely T-Town Hino (a dirty look), she stands there miserable, waiting for some old lady to pick out her 23 scratch off tickets one by one. 3 to 4 people stand in line behind her with Bud Light, fountain drinks, snacks, and nicotine appetites with the same look on their faces as the cashier. But do you know what we all have in common? We are all feeling the awesome warmth of the heat lamps on our right arms, keeping this whole array of wonderfully fried, assorted-carbohydrate-lovelyness warm. There they stand, proud among the rest of this incubator circus-snack carnival: The Allsup’s Burrito. Keep in mind that it is almost impossible to refuse this Land of Enchantment delicacy while standing there waiting for scratch off lady to pick out her last 9 tickets. 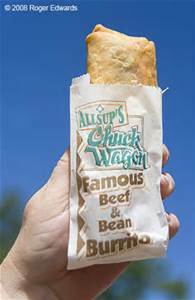 This Allsup’s legend thus far has come in 2 different styles (1) The Beef and Bean (also known as” the classic”) and (2)The Chicken Chimichanga (also known as the “Chimi”). Me myself I have always been a Beef and Bean guy, but I’d say the ratio of New Mexicans on these 2 burritos is about 50/50. It also reveals a lot about someone’s personality. When I was a kid my stepdad and I used to go fishing or just on a road trip to Texas. 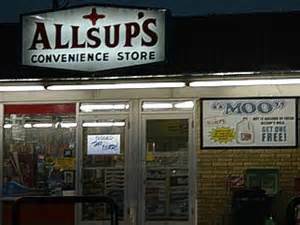 We would stop at Allsup’s in Santa Rosa, NM because it was like 3 hours into our trip from Taos, which would start at 5 in the morning so you’d be hungry by then. Breakfast of New Mexico Champions!!! When I was about 17, in 1997, partying in Taos was on the daily, and I’m pretty sure I’d be dead right now if it wasn’t for Allsup’s and their magical burritos. I’ve fainted in the in the Gatorade section a couple times, escorted by 3 lovely crazy girls at the northside Taos Allsup’s. Dinner of New Mexico Survivors!!! If you haven’t had one, you’re in luck: Allsup’s is open 24 hours a day.The only 24-hour spot in Taos, one on each end of town (which is what we used to call “the cruise”), so you have no excuse even if you are a tourist. Back to standing next to the heated protective glass that keeps me from my Fried Ecstasy of New Mexican Goodness. There lie seasoned wedge fries, tamales, chicken strips, jalepeno poppers, and more. How could one resist? Other gas stations don’t have this stuff — I’ve been eating these bad boys since 1988 — I can’t stop now!!! So I approach this ray-of-sunshine cashier, who informs me that they do not carry the Bic brand of lighters. I say, with a special look and accent, “Gimme all the Burritos you got left,” and I wait for that look of “no you didn’t get all the burritos” to hit me between the eyes before she walks over to grab my meal of destiny. You pay, you walk out to your car, you crinkle open that white grease-stained paper bag. Break that beef and bean in half, pour li’l packet of taco sauce on it, close your eyes, smile, and have New Mexico heart-squeezing, I mean -warming, thoughts. Today there are 300 Allsup’s stores in 160 towns and cities in New Mexico, Texas, and 1 in Frederick, Oklahoma. 3,000 employees, many of them with the company for 20 years or more. Good Job Lonnie!!! The Allsup’s Burrito is now known all over the world, and loved by many. “Sometimes something so bad, is so good.” Thank you Mr. and Mrs. Allsup, I don’t know where i would be without you. Congratulations!! !